The Interact Club and Oberlin Club Rotarians met for their second “Sewing Party” to make pillowcase dresses for Zimbabwe and Haiti. In the fall, senior Angela Mavrich organized the first party at her home and in March the students met in the Family and Consumer Science classroom. Rotarians, high school students and Kendal residents enjoyed this multi-generational project and are continuing to sew at home and at school in their free time. 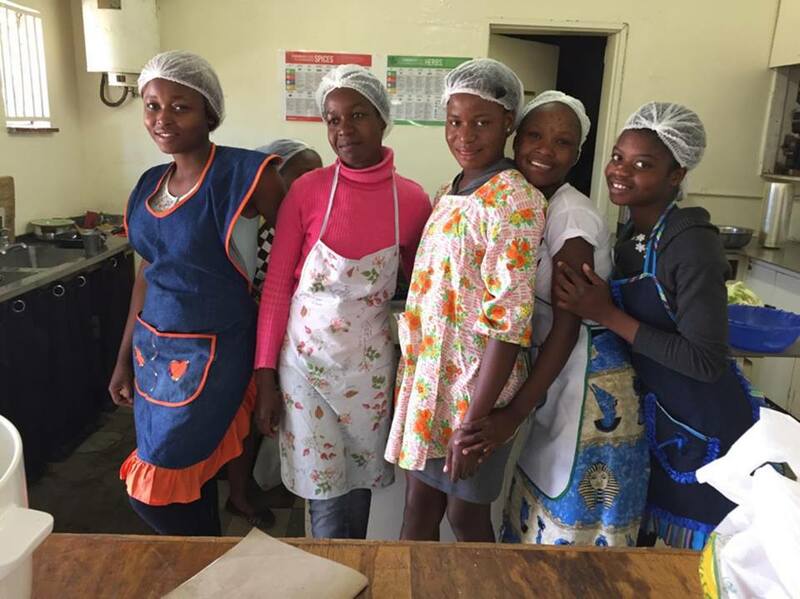 The idea of sending dresses to little girls in other countries came about when OHS parent and Rotarian, Melanie Satterfield heard about the projects of Jack Hopkins. Mr. Hopkins has dedicated his life to bringing potable drinking water to remote African villages. 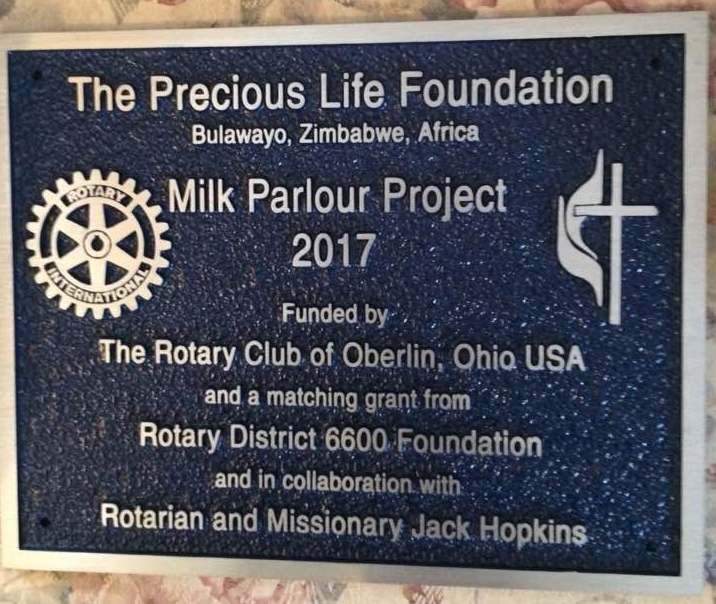 With a grant from the Oberlin Rotary Club, Mr. Hopkins brought dresses to Mahatchala, Zimbabwe where he built a water well near the Emsizini Middle School. At the orphanage he also helped begin a garden and orchard. In Zimbabwe there are many orphans because of of the HIV epidemic, some 30% of people now have HIV. The students are excited that their dresses will be brought with Mr. Hopkins and given to the children at the school and two orphanages. Our very own senior, Abigail Tackett will also be bringing some of the dresses to Haiti on her next missions trip to work with children at Destiny Village, an orphanage supported by her church. Our Rotary club held its annual pancake breakfast on Sunday March 5th. While the figures are preliminary we seemed to have grossed $2300.00 and had some 300 people attending. Young people from the Interact club helped out as well as most members of our club. Each month the Oberlin Rotary Club honors select students as “Senior of the Month.” These young people are recognized for their good character and positive attitude. They have contributed their time and energy to helping the school and community and are excellent role models. 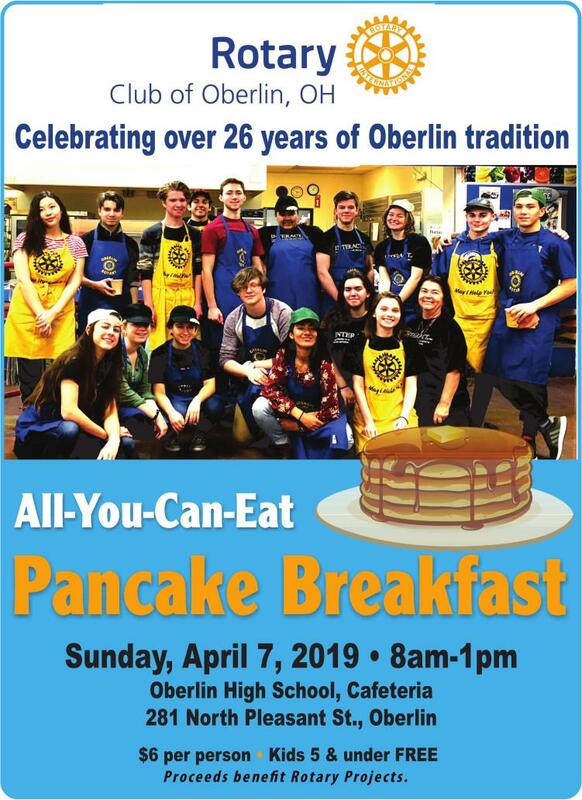 The Oberlin Rotary Club will donate $25.00 to a charity or project of the student’s choosing in their name. The Oberlin High School senior honored for the month of February was Abigail Tackett. has played volleyball for 4 years, serving as co-captain for the past two years, receiving MVP and Coach’s Award. She also played basketball and ran track for the first two years of high school. Outside of school Tackett is involved in the youth group (Discovery Student Ministries) at Church on the North Coast (CNC), leading worship and acting as a student leader. She currently works at CNC as a pastoral assistant/administrator and previously enjoyed being employed at Ben Franklin in Oberlin. Service is a part of Tackett’s life. She volunteers at the “Joshua Kids” inner-city children’s program held once a month at CNC and a week-long overnight camp in the summer. She also works with the Love Haiti Fund, an organization dedicated to creating sustainable growth in the nation of Haiti. Tackett helps with fundraising, as well as traveling on service trips with teams of volunteers. She has been on two trips in 2016 and has a trip planned for August of 2017 to minister to the children at Destiny Village, an orphanage supported by her church. During high school, Tackett chose the Post-Secondary option which has allowed her to attend Lorain County Community College free. She will graduate from high school with 45 college credits. She plans on finishing her Associates Degree at LCCC in the fall and will transfer to Ashland University with the college partnership. Tackett plans to pursue a bachelor’s degree in young adult education to eventually teach high school English or Social Studies/History. Welcome Maxime-Zoe Knoth, Oberlin Rotary Exchange student from Germany! Senior, Heidi Fredrickson has enjoyed a Family to Family Exchange Program this summer sponsored by the Oberlin Rotary Club. Steven Mentzer was a Rotary Youth Exchange to Taipei, Taiwan from August 2013 to June 2014 spending the entire 2013-2014 school year at JingWen High School. President Mary Aufdenkampe is pictured with Serenity Crowley who is the short term outbound to San Paulo District 4430 and she is currently hosting Jaqueline Ruiz Nunes da Silva from San Paulo. Oberlin Rotary Club President Melanie Satterfield recognizes Max Annable and Tong Li for their efforts to raise money for the Interact BackPack Program by planning a implementing a 5K run. The students raised over $300 dollars enough to supply food for three students. Oberlin High School students Nick Gonzales and Justine Linker recognized by Oberlin Rotary President, Melanie Satterfield for their outstanding service to the community. Linker and Gonzalez prepared the food for the BackPack Distribution every week and helped pack and deliver the food to 104 elementary students every Thursday. The Oberlin School Endowment Fund, The Bill Long Foundation, The Stocker Foundation and the Oberlin Rotary Club provide grants to make this program possible. Interact Club was honored at a weekly noon luncheon of the Oberlin Rotary Club for their outstanding work in the community. The Oberlin Rotary Auction is SOLD OUT! Thank You for your support! Each month the Oberlin Rotary Club honors seniors as “Senior of the Month.” These young people are recognized for their good character and positive attitude. They have contributed their time and energy by helping the school and community and are excellent role models for the students at Oberlin High School and the Lorain County Joint Vocational School. The Oberlin Rotary Club will donate $50.00 to a charity or project in the student’s name. Congratulations to the Oberlin Rotary Students of the Month for April. Taylor Anderson from Oberlin High School and Patrick Gray from LCJVS. Students of the Month for March are James Zhang (OHS) and Day Metivier (JVS). Congratulations to you both! Congratuations to Tye Allgood and Breanna Richardson on being the Oberlin Rotary students of the month for November, 2013! 2014 All You Can Eat Pancake Breakfast - Coming Soon! The Oberlin Rotary Club presents...the All You Can Eat Pancake Breakfast, Sunday, March 2, 2014 from 8am–1pm. Congratulations October Student of the Month, Reilly McInerney from Oberlin High School. Congratulations September students of the month, Colleen Gilfether (Oberlin High School); and Alan Tucktosh (LCJVS). On September 6 the OBERLIN ROTARY CLUB raised $340 for Oberlin Chorister’s. Artistic Director Jennifer Call presented a video showing the organization’s ability to interest young children throughout the North Coast area in music, creativity, and learning. The Oberlin Rotary Club will be serving up brats at the Oberlin Family Fun Fair on August 3. Stop by grab a brat and have your photo taken to benefit the Rotary Club's fund to eradicate polio. Incoming Oberlin Rotary Club President Melanie Satterfield accepts the gavel from outgoing President Rex Engle. Rex will now become the District 6600 Governor for the year 2014/15. Students of the Month for April are Alexander Ladina (LCJVS) and Briana Bumgardner (OHS). Congratulations on your achievements! Students of the Month for March are Monte Young (LCJVS) and Aungelique Owens-Williams (OHS). Congratulations on your achievements! February's student of the month is Kyle Moe from JVS. Congratulations on your accomplishments Kyle! Student of the month for January 2013 is Blythe Coleman-Mumford from Oberlin High School. Congratulations on your accomplishments Blythe! Welcome to new Oberlin Rotarian, Wendy Holliday, who is the Vice President of Marketing and Member Services at NACS. She is pictured here with her sponsor Jim Hieb. Jennifer Gallo, health educator and teacher presented a brief talk about her participation in and her enthusiasm for Camp Sunrise. Gallo and her husband Justin have been volunteer counselors for 7 years and have become passionate about this amazing wonderful camp for the children who have been affected by HIV/AIDS. Gallo related many stories about the children who have benefited from the experience of being at camp and of the relationships that are built through their summer experience. She also shared the story of how Camp Sunrise started and the strong Oberlin connection. Rotary Member, Mark Fahringer from the Salvation Army is looking for volunteers to ring the bell around the holidays in Oberlin's business districts. To offer a "helping hand" please contact Mark. The Salvation Army relies on this money to serve the community. Students of the Month for November are Jessica Brewster (LCJVS) and Glenna Medwid (OHS). Congratulations on your achievements! In celebration of the Oberlin Rotary Club's 75th Anniversary, the club raised $7500 for trees to be planted in Oberlin. Club President Rex Engle presented the check to Oberlin City Manager and Rotarian, Eric Norenberg in October. Check out the list of trees to see where they are being planted around the city. 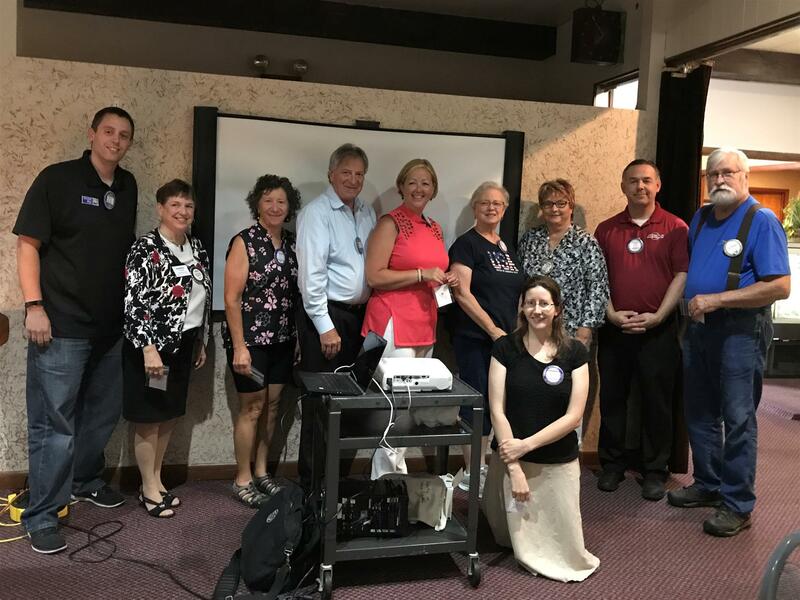 During the month of October, Oberlin Rotary welcomed new members Liz Schultz and Mark Fahringer. Both Oberlin residents, Liz was sponsored by Pat Holsworth and works at the Oberlin Heritage Center. Mark was sponsored by Judy Riggle and works at the Salvation Army. Welcome Liz and Mark!